The way I see Italy. 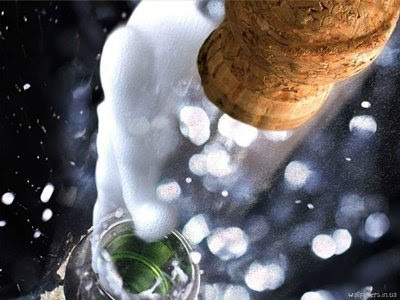 : Happy New Year! Thank you for all the holiday wishes and presents from everyone. It's an especially hard holiday season for almost everyone economically, but I was moved by everyone's sentiment and cheer. I did not celebrate Christmas growing up, so I don't as an adult. However, it's hard not to wish everyone a joyous season, because all of you are so wonderful and deserve the best regardless of the time of the year. For Christmas Eve, Mateo and I went to an organic winery for lunch. I left simply stuffed to the gills! The food was so good and the portions small, but there were over SIX COURSES! For New Year's Eve, Mateo had to work. I was invited to Munich, Germany and to my neighbor's house, but the weather was so awful I decided to stay home. Besides, it's not much fun to kiss a stranger at midnight while your husband's off working. New Year's Eve snowed and snowed and snowed. All night. They were the biggest snowflakes anyone here has ever seen! I literally keep opening the window to catch a few in my hand to shake my disbelief! Needless to say, New Year's day the driveway needed to be shoveled. The only shovel we had was an emergency one we keep in the car, but the handle broke on it before I even started. Can you believe that not a single person I asked had a shovel?! Of course, it's also a holiday, so no stores were open either. Unlike in the states, we don't have 24-hour convenience stores. I guess that's why they call them CONVENIENCE stores because they are a convenient privilege instead of a right, which I had mistaken them for. So I squatted down and scooped all the snow up with a handle-less shovel. It was a workout! The next day I was sore in the strangest ways. In Italy, the holidays continue until January 6th: The Day of the Epiphany. 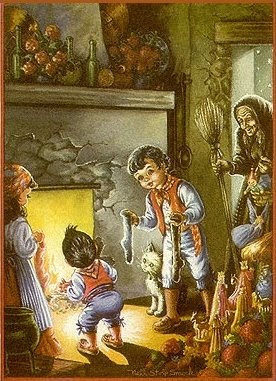 It's the day when La Befana (the witch) comes and brings presents to all the good boys and girls. Yes, not Santa. A witch. I find this very odd. It's a bigger gift-giving day than Christmas. Christmas is strictly a religious holiday here: church and dinner with the family. Also, popular tradition avers that if one sees La Befana one will receive a thump from her broomstick, as she doesn't wish to be seen. This aspect of the tradition may be designed to keep children in their beds while parents are distributing candy (or coal) and sweeping the floor on Epiphany Eve. On this special holiday Mateo and I were in Merano celebrating my birthday. You'll see another post about that. So, our hoidays were low-key, spent mostly with just each other, and enjoyable. Hope you all have picked resolutions you can stick with!! !